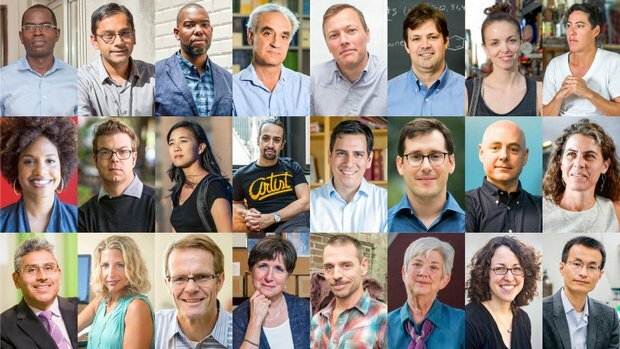 The 2015 MacArthur Genius Grant recipients. Journalist Ta-Nehisi Coates, puppetry artist Basil Twist and neuroscientist Beth Stevens work in wholly unrelated fields, but they do have at least one thing in common. Along with 21 others, they are winners of the 2015 "genius" grants from the John D. and Catherine T. MacArthur Foundation. "When I first got the call from the MacArthur foundation I was ecstatic," Coates said ina video on the foundation website. The national correspondent for The Atlantic, who writes about racial identity and systematic racial bias, added, "You know, if anybody even reads what I&apos;m doing, that&apos;s a great day." The fellowship recipients hail from a variety of fields including music, photography, biology and economics. Each will receive $500,000 over five years to continue his or her work or pursue something entirely new. Many of this year&apos;s winners have been covered by NPR at some point in their careers — most recently, playwright, composer and performer Lin-Manuel Miranda was the topic of discussion last week on All Songs Considered. Additionally, writer Ben Lerner&apos;s books have been reviewed by NPR&apos;s Maureen Corrigan, urban sociologist Matthew Desmond was a guest on Tell Me More in 2010, computational biologist John Novembre appeared on Morning Edition in 2011, education entrepreneur Patrick Awuah was featured on Ted Radio Hour in 2012, Twist was interviewed about his abstract pupeteering in 2012, and Coates was interviewed in July on Fresh Air about his book. Plus, Tuesday on All Things Considered, you can hear interviews with three other winners: tap dancer and choreographer Michelle Dorrance, Princeton historian Marina Rustow and photographer and video artist LaToya Ruby Frazier. "For me, my camera has been that catalyst for me to really look at these situations head on and not flee from them," Frazier said of her work documenting social inequality and historical change in her hometown of Braddock, Pa. Frazier was alsofeatured on NPR&apos;s CodeSwitch blog in May, talking about her book, The Notion of Family. Patrick Awuah, 50, Accra, Ghana: "Education entrepreneur creating a new model for higher education in Africa that combines training in ethical leadership, a liberal arts tradition, and skills for contemporary African needs and opportunities." Kartik Chandran, 41, New York: "Environmental engineer transforming wastewater from a pollutant requiring disposal to a resource for useful products, such as commodity chemicals, energy sources, and fertilizers." Ta-Nehisi Coates, 39, Washington, D.C.: "Journalist interpreting complex and challenging issues around race and racism through the lens of personal experience and nuanced historical analysis." Gary Cohen, 59, Reston, Va.: "Environmental health advocate spurring environmental responsibility among health care providers and repositioning health care institutional practice around the broader challenges of sustainability, climate change, and community health." Matthew Desmond, 35, Cambridge, Mass. : "Urban sociologist revealing the impact of eviction on poor families and the role of housing policy in sustaining poverty and racial inequality in large American cities." William Dichtel, 37, Ithaca, N.Y.: "Chemist pioneering the assembly of molecules into stable, high surface-area networks with potential applications in electronic, optical, and energy storage devices." Michelle Dorrance, 36, New York: "Tap dancer and choreographer reinvigorating a uniquely American dance form in works that combine the musicality of tap with the choreographic intricacies of contemporary dance." Nicole Eisenman, 50, New York: "Painter expanding the expressive potential of the figurative tradition in works that engage contemporary social issues and restore cultural significance to the representation of the human form." LaToya Ruby Frazier, 33, Chicago: "Photographer and video artist capturing the consequences of postindustrial decline for marginalized communities and illustrating how photography can promote dialogue about historical change and social responsibility." Ben Lerner, 36, New York: "Writer transcending conventional distinctions of genre and style in works that convey the texture of our contemporary moment and explore the relevance of art and the artist in modern culture." Mimi Lien, 39, New York: "Set designer translating a text&apos;s narrative and emotional dynamics onto the stage in bold, immersive sets that enhance the performance experience for theater makers and viewers alike." Lin-Manuel Miranda, 35, New York: "Playwright, composer, and performer expanding the conventions of musical theater with a popular culture sensibility and musical styles and voices that reflect the diverse cultural panorama of the American urban experience." Dimitri Nakassis, 40, Toronto, Canada: "Classicist challenging long-held assumptions about modes of economic exchange and political authority in prehistoric Greek societies and revealing their connections to the origins of modern civilization." John Novembre, 37, Chicago: "Computational biologist shedding new light on the links between geography and genomic diversity and producing a more finely grained picture of human evolutionary history." Christopher Ré, 36, Stanford, Calif.: "Computer scientist democratizing big data analytics through open source data-processing products that have the power of machine learning algorithms but can be integrated into existing and applied database systems." Marina Rustow, 46, Princeton, N.J.: "Historian mining textual materials from the Cairo Geniza to deepen our understanding of medieval Muslim and Jewish communities." Juan Salgado, 46, Chicago: "Community Leader creating a model for workforce development and training among immigrant communities through a holistic approach that addresses language skills, education, and other barriers to entering the workforce." Beth Stevens, 45, Boston: "Neuroscientist revealing the heretofore unknown role of microglial cells in neuron communication and prompting a fundamental shift in thinking about brain development in both healthy and unhealthy states." Lorenz Studer, 49, New York: "Stem cell biologist pioneering a new method for large-scale generation of dopaminergic neurons that could provide one of the first treatments for Parkinson&apos;s disease and prove the broader feasibility of stem cell-based therapies for other neurological disorders." Alex Truesdell, 59, New York: "Adaptive Designer and Fabricator constructing low-tech, affordable, and customized tools and furniture that enable children with disabilities to participate actively in their homes, schools, and communities." Basil Twist, 46, New York: "Puppetry artist and director revitalizing puppetry as a serious and sophisticated art form in imaginative experiments with its materials, techniques, and uses in both narrative and abstract works." Ellen Bryant Voigt, 72, Cabot, Vt.: "Poet meditating on will and fate and the life cycles of the natural world through a distinctive intermingling of lyric and narrative modes and ongoing experimentation with form and technique." Heidi Williams, 34, Cambridge, Mass. : "Economist unraveling the forces that hinder or spur medical innovation through empirically based studies that are informing public policy." Peidong Yang, 44, Berkeley, Calif.: "Inorganic chemist opening new horizons for tackling the global challenge of clean, renewable energy sources through transformative advances in the science of semiconductor nanowires and nanowire photonics." Note: NPR is among the organizations that the John D. and Catherine T. MacArthur Foundation supports.